Map & Data can be turned off easily by clicking the ‘X” in the upper right-hand corner. To turn it back on find the blue arrow tab on the Left side and middle of your map screen and click it open. Map Business Online users access layer editing functions in Map & Data by either clicking the Edit Gear on the M&D tool bar, or by hovering over a given layer and clicking the Edit Gear that pops up. By using the overall M&D toolbar and clicking its Edit Gear the user opens a panel view with background options and the Filter by State tool, the Map Title control, the Map Legend control, and the Delete Draw Layer control. The user can also convert miles to kilometers here. From this high level control panel access individual layer controls by choosing the “Map & Data” tab along the top. Place your cursor in the light blue areas to edit specific geographic layers like zip codes. The geographic layer must be checked on to enable layer editing. You could forgo the selection of the overall toolbar for M&D and instead hover over any geographic or imported data layer until the Edit Gear pops up. Click that edit Gear and enter the editing functions for the layer you choose. Either way, once you are in the data layer of choice, you can select which Tab to edit – General or Labels, they are noted in vertical text along the right side. General enables map layer outline adjustments for thickness and color. It also presents transparency controls. You can also color code you layer objects here. General also offers the Calculate Data option for combining demographic data layers. Auto label – That’s the state, zip code or county name label. On of the coolest things you can do in Map Business Online is append data to a label. Try it. Add demographic data or data you imported to a label. It’s a great way to reference key data. When you click the M&D overall toolbar Edit Gear you’ll also see Territory Options in the panel control view. Here you can set territory transparency and turn on the intersection or overlap tool. 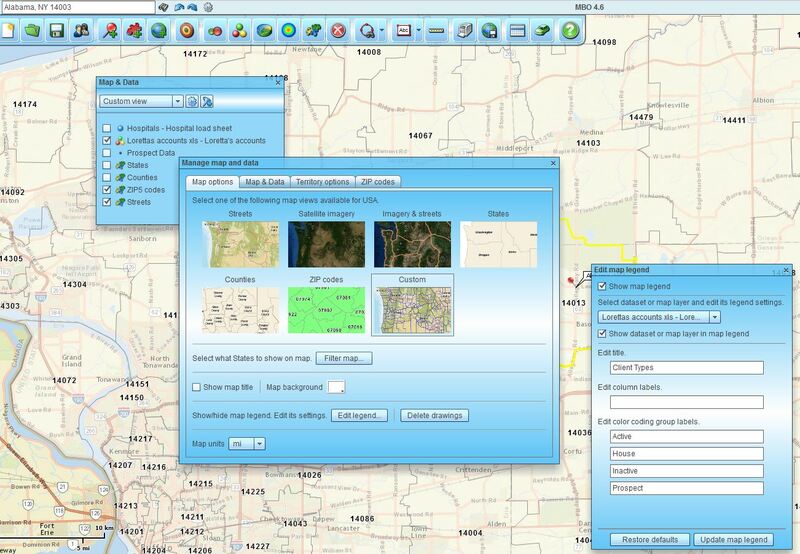 The ability to allow and identify territory overlap is extremely helpful in sales territory management. And you’ll see that you can control the color of the overlap by clicking into the associated color box. Also noted included in the Edit Panel view tabs, all the way to the right, is the Zip Code tab. Click here to reset the origin and capabilities of your zip code layer. Map Business Online comes with Census ZCTA zips turned on. For greater flexibility in generating zip code territories try USPS Zip codes with fillers. This will allow you territories to color shade in national park areas. You’ll see explanations of the various zip code layer options listed there as well. 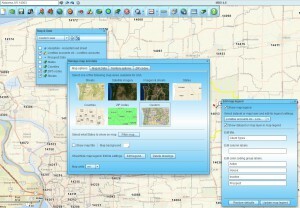 Do not be afraid to build some maps using various aspects of the Map & Data box controls. This is a great way to learn how Map Business Online can help you use business mapping software to support your business. This entry was posted in Uncategorized and tagged best mapping software, Business mapping software, sales territory mapping, zip code maps. Bookmark the permalink.